I can’t speak for everyone else, but when I see a number like that it makes me think that you can prevent a heart attack in more than 1 out of 3 people. But four years ago, Businessweek pointed out the details of the fine print below the glaring asterisk of the 36% number. What that boils down to is maybe one fewer heart attack per 100 people. What wasn’t covered in the article was how such a huge number came to be. That 36% is a real number and this is how its done. 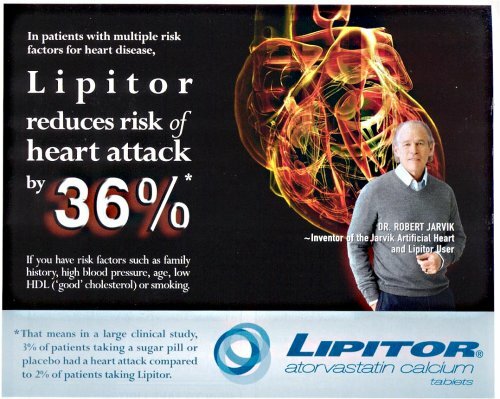 So the odds of heart attack for the Lipitor group is 2:98 which is 0.02041 and the odds of heart attack on sugar pill is 3:97 which is 0.03093. Next, you take these two numbers and you do (odds with Lipitor)/(odds with sugar pill) which is (0.02041)/(0.03093). This comes out to 0.66 which means the odds of a heart attack on Lipitor is 66% to the odds of having one with a sugar pill. You then subtract 1.00 from the percent: 1.00-0.66 and you get 34% lower. The reason it is not 36% exactly is because the 2 and 3 percent numbers used were probably rounded. The confusion comes because we don’t often think in terms of relative risks but absolute risk instead. Was that Ad portraying the 36% as a relative risk instead of an absolute risk? Hmm, that depends on the reader but I definitely thought it was absolute risk when I first saw it. BTW if sugar really is the culprit behind heart disease and not fat….maybe they shouldn’t be giving sugar pills to control groups in these sort of studies! This entry was posted in Cholesterol, Media and tagged FatNurse, heart attack, Lipitor, odds ratio, Statins, Statistics, TheFatNurse. Bookmark the permalink.